I will say that 1984 was a year that understood how to make history. Apple launched it's Macintosh computer for the masses, two astronauts walked the stars like gods, and singer Marvin Gaye, who sang about how sweet it was to be loved, was shot through the heart and killed by his father. Setting the tone for this era, McDaniel continues to create a story which feels very much of that time, dealing with big issues such as race, religion and sexuality. When Autopsy Bliss invites the devil to Breathed, he has no idea the chain of events he is about to set in motion. Sal, a young black boy with a penchant for telling dark fables rooted in his own troubled past, and a lost soul, shows up in the small town, claiming to be answering Autopsy's call. Autopsy's son Fielding (our narrator) introduces this strange boy as the devil, a fact he is somewhat uncertain of. However, Sal's intellect and ability to see the truth of people's internal suffering lend him an otherworldly air. When bad things begin to happen in the town - a drought, an accident with a pregnant woman - a group of townsfolk begin to blame Sal. Amidst the unbearable heat, a hatred begins to bubble over. But the book is more than just the story of Sal, and feels to be an exploration of family life. Fielding's brother Grand is outwardly perfect, a talented baseball player but harbouring his own secret, one that will ultimately destroy him. The Bliss family are a wonderfully peculiar set of characters, one whose ties are tested as the book reaches its dramatic conclusion. This is a truly unique novel and a breath of fresh air compared to a lot of the stories on the bestseller list. We get this wonderful story arc in which a boy is forced to see the darker the side of the world, both through the actions of others and through his own pain. It beautifully written and I often found myself re-reading sections, I was so enthralled by McDaniel's ability to put together new and unusual sentences. 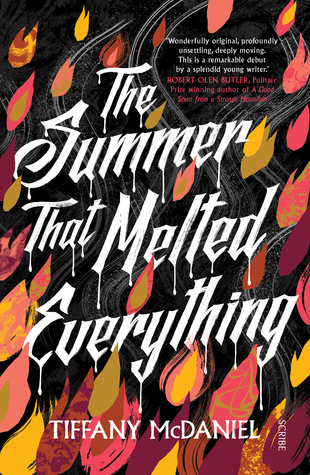 The Summer That Melted Everything is written with a deep and poignant melancholy and is truly moving. I will eagerly await McDaniel's next literary offering. With thanks to Tiffany McDaniel and Scribe publishing for an advanced copy in exchange for an honest review. This sounds a little bit like Edgar Allen Poe's 'The Devil in the Belfry', do you think it is similar? I haven't read the novel but I will be adding it to my list. Thanks for another great recommendation. I don't think I've read this... I have a copy of The Summer That Melted Everything. I'll pass it to you!